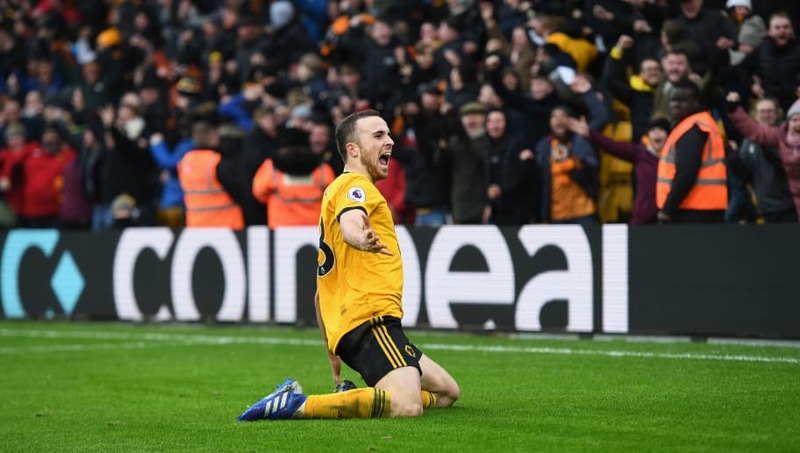 ​Diogo Jota's magnificent hat-trick stole maximum points in a 4-3 thriller between Wolves and Leicester on Saturday afternoon. The visitors fought back from a two goal deficit in an incredible finish, which saw Jota double his tally for the season in one afternoon. Full time and Molineux erupts! In a frantic opening period, it took just three minutes for the deadlock to be broken. After a superb save to deny Ruben Neves from long range, Kasper Schmeichel was left helpess as Joao Moutinho's pinpoint cross was met first time by Jota. Rui Patricio then nearly gifted Jamie Vardy an opening after being caught on the ball, before Nuno Espirito Santo's outfit doubled their lead when Ryan Bennett rose tallest beyond Harry Maguire to blast a bullet header beyond Schmeichel. In a shambolic defensive display, the visitors' fragility demonstrated in their ​loss at Southampton was being exposed once more and Jota should have extended his side's lead before the interval. But within the restart, the hosts were undone in a manic two minute spell. Demarai Gray's neat finished halved the deficit, before Premier League debutant Harvey Barnes fired in the equaliser to stun the home crowd. Jota then restored the hosts advantage with his second of the game, before Wes Morgan looked to have stolen a point with five minutes remaining - only for a final twist in this topsy-turvy affair. After collecting a Raul Jimenez pass, Jota fired in a 93th minute winner to send Molineux into pandemonium, ending in Santo being sent to the stands in the aftermath. Having already beaten the likes of ​Chelsea at Molineux this season, ​Wolves came out the firing blocks quickest against their close challengers. In their accustomed 3-5-2 set up, front pairing Jota and Raul Jimenez tormented a shody back line, with Ruben Neves playing in an advanced attacking role. The trio displayed a ruthlessness to this performance often lacking in previous matches and fully deserved to come away with all three points. Starting XI: Patricio (6), Bennett (7), Coady (6), Saiss (6), Jonny (7), Vinagre (6), Dendoncker (7), Neves (8), Moutinho (8), Jota (9*), Jimenez (8). Substitutes: Gibbs-White (N/A), Doherty (N/A). At the forefront of a clinical first half attacking display, Jota was a menace all afternoon. Showing great composure for the opener, the Spaniard demonstrated a typical all round display with his clever movement in the final third. Despite not having the pedigree of a recognised striker, the former ​Atletico Madrid man showed incredible composure for his goals and in truth, could have had six if it wasn't for the heroics of Leicester's shot-stopper. Having scored at the wrong end in their defeat at ​Manchester City last time out, Conor Coady's luck evaded him once more. The captain, so often lauded for his defensive steel this season, failed to martial his makeshift backline, whose blushes were ultimately spared. With discontent growing among the ​Leicester supporters in recent weeks, this result would have further increased the pressure on the under-fire Claude Puel. Cutting a frustrated figure throughout, the Frenchman doesn't appear to be getting the best out of his squad. His decision to leave James Maddison on the bench would have bewildered the majority of the Foxes faithful, especially after he assisted his side's third goal once he came on. Their upcoming fixtures don't make for pretty reading either - facing ​​Liverpool, ​Manchester United and ​Tottenham in their next three. Starting XI: Schmeichel (7), Simpson (5), Morgan (6), Maguire (5), Chilwell (5), Ndidi (5), Mendy (5), Ricardo (5), Barnes (6), Gray (7*), Vardy (6). Substitutes: Evans (5), Maddison (6), Iheanacho (N/A. Despite their defensive woes, Leicester looked a threat on the counter attack through Demarai Gray. Having been denied on a few occasions in the first half, the 22-year-old was rewarded for his endeavour after handing his side a way back into the encounter. Displaying pace, power and an eye for goal, his performance would have repaid the faith shown by Puel. Among a torrid defensive display, England international Harry Maguire was at fault for Wolves' second goal after failing to thwart Bennett from a corner. Manchester United should not touch Harry Maguire with a 20-foot barge pole. From there, the centre-half looked a shadow of the England hero from the World Cup and was eventually replaced after suffering an injury. Following their last gap victory, Wolves have climbed ahead of the opponents, ahead of their FA Cup Fourth round tie at Shrewsbury next Saturday. Meanwhile, Leicester face a daunting task at league leaders Liverpool in 11 days time as they stew over this defeat.